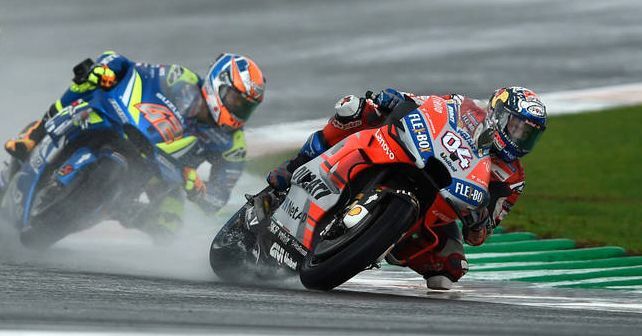 In a wet and wild race at Valencia, Andrea Dovizioso took the final win of the 2018 MotoGP, ahead of Suzuki's Alex Rins. Red Bull KTM Racing took their first-ever podium with Pol Espargaro at the helm. The 2018 MotoGP has come to a close as the final round of the season got underway at Valencia in Spain. Sure, the rider and constructor championships were already done and dusted before this race, but the season finale lived up to the expectation – it was a proper nail-biter where wet weather ensued chaos from the very first to the last lap. The whole race was affected by a heavy downpour, meaning it turned out to be a crash fest. Still, in the end, it was Andrea Dovizioso of Ducati who won the final race of the season, ahead of Suzuki’s Alex Rins and KTM’s Pol Espargaro. Espargaro needs a special mention because he quite literally dragged his machine in the tough and treacherous conditions so as to get Red Bull KTM their first-ever podium in the premier class. The Valencian Grand Prix started in wet conditions, with Yamaha’s Maverick Vinales on pole position. However, given the conditions, it was anyone’s race because by the end of lap 2 it was pouring at the track and the conditions were downright slippery. This resulted in one too many crashes, including that of 2018 World Champion, Marc Marquez (Repsol Honda) and pole-sitter Vinales. However, at the same time, Suzuki’s Rins was absolutely gunning it at the front. Not only did he lead the race from the very first lap, but the Suzuki rider was so comfortable at the front that he managed to build a gap of over 3 seconds over Dovizioso in second. Meanwhile, Yamaha’s Valentino Rossi had a cracking start as he yet again displayed his wet weather masterclass – he sliced through the field to take the third spot despite starting the race in 16th! However, the conditions went from bad to worse with more and more riders hitting the gravel. There were multiple crashes, one after the other, lap after lap, while those who stayed upright were experiencing aquaplaning on straights. As a consequence, the race was red-flagged after lap 15 but was again re-started as the conditions got better. With nearly half of the grid already wiped out, Rins started the race from pole position after the quick restart procedure. He was followed by Dovizioso and Rossi and the trio quickly broke away from the rest of the pack. While Rins was leading initially, Dovizioso was remarkably faster of the three. He passed Rins easily and increased his gap at the front by over a second. Rossi also passed Rins for second place, but in his quest to catch Dovizioso, he crashed out. Rossi’s crash meant Espargaro, who was running fourth before Rossi’s crash, was now inside the top three and finished the race in the very same position. Behind the top three was Ducati’s test-rider and wildcard Michele Pirro, who took the fourth spot ahead of Repsol Honda's retiring Dani Pedrosa in fifth. LCR Honda’s Takaaki Nakagami finished the race in sixth, while Johann Zarco became the top MotoGP Independent rider of 2018 by taking seventh place with his Tech 3 Yamaha M1. Red Bull KTM’s Bradley Smith finished his MotoGP career in eighth, ahead of LCR Honda’s wildcard Stefan Bradl. Tech 3 Yamaha’s Hafizh Syahrin rounded out the top ten.